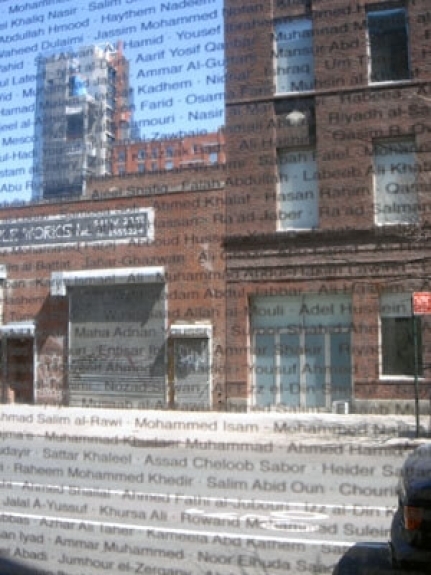 Carolina Nitsch is pleased to present Samar Hussein by Vera Lutter at Carolina Nitsch Project Room in Chelsea, New York. This exhibition is a two part presentation including a DVD wall projection of an endless loop of images with a name list mounted on all windows as well as a portfolio of nine prints. 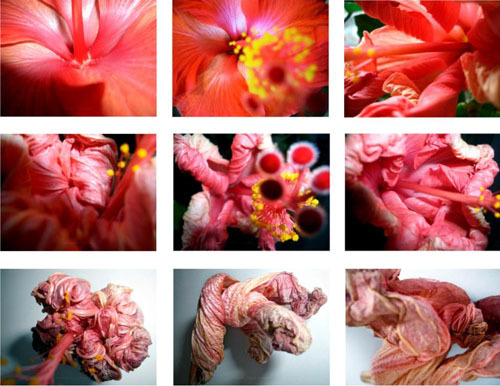 “Images of a blooming Hibiscus plant are used to allude to the cycle of human life, from the unfurling of the first bud to the rotting of a decaying, shriveled blossom. The flesh-colored tones of these flowers together with their of ten surprisingly sensuous , sometimes sexual formations, lend themselves to the memory of human life, its beauty and joy, and to the memory of flesh, wound, and death. The blooming period of this plant covered a distinct time frame, as did each individual blossom. Photography’s intrinsic relationship to time, forever sends an at -once-present moment into the past , which in itself continuously slips further away from us. The obtained, tangible image holds the breath of that very moment. Vera Lutter received her MFA in Photography and Related Media in 1995 from the School for Visual Arts in New York. Trained in Munich as a sculptor, Lutter was inspired upon arriving in New York City by its urban chaos and industrial landscape. Her attempt to capture the current of the city became her first experiment with the camera obscura. Lutter’s photography is known from her projects on architectural or industrial landmarks and places with iconic resonance, from the abandoned Pepsi Cola Factory in Long Island City to the now defunct Batter sea Power Station in London. Her depiction of these structures emphasizes their formidable stature while personifying their melancholic solitude and isolation. A haunting quality and ethereal tones dominate Lutter’s images, reflecting the passing of time and signifying both the transient and the perpetual. Vera Lutter’s photographs have been exhibited at Dia: Beacon and Dia: Chelsea, New York; Kunsthalle, Basel; The Museum of Modern Art, New York; and the Whitney Museum of Ar t, New York. Her photographs are in the permanent collections of the Metropolitan Museum of Art, the Whitney Museum of Art, the Museum of Fine Arts, Houston, the Neue Galerie and the San Francisco Museum of Modern Art, among others. Vera Lutter is represented by Gagosian Gallery and Galerie Max Hetzler.